Don't forget to ask Santa for all those lovely garden supplies ;) And take advantage of all the wonderful seed catalogues showing up in your mailbox – they are great tools for planning 2016 gardens and for doing activities with your students. Kaitlin and I hope you have a joyous and safe holiday season. Looking forward to new gardens & growing in 2016! 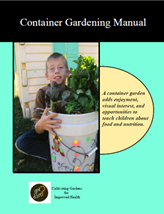 Don't Miss Out on School Garden Resources! As you rake the straggling leaves in your yard and savor the last tomatoes of the year, planning next year's school garden is likely not the first thing on your mind. Rightfully so! If you follow the school garden article series – the last one was all about how to put your garden to bed and let it rest over the winter. This article was written to shift that mindset and share that you will have more access to resources if your school garden team starts planning for next year now. While it may feel premature to mentally skip over the upcoming winter and start envisioning what you'll be planting in the spring and what you'll need for a successful garden – that's exactly what we recommend that you do. This is because the majority of school garden grants are open right now, and into the early winter of 2016. This requires you and your school garden team to be planning for 2016's garden. This seemingly odd timing is due to grant cycles. Funders need time to accept applications, review and vet proposals that they would like to fund. Many school garden grantors receive hundreds of applications and need a healthy window of time to properly review them. In Michigan, the ideal time to receive your garden grant money is in the spring, as you begin building, expanding or preparing your garden. In order to distribute grant moneys to align with spring activities, funders need to receive proposals in the early winter. Many grants have deadlines from late October to early January. A digestible list of garden grants is shared monthly in the Michigan School Garden Newsletter, which is shared through the MI Farm to School email list. If you are interested in receiving Farm to School and school garden information, you can sign up for that list here, under the heading "Link to Local Food". If you are interested in doing further research on available grants, try Garden ABCs, America in Bloom or Kids Gardening, which keep an extensive (although not comprehensive) list of garden grant opportunities. Every year my Extension colleagues and I offer an all day workshop called "Starting and Sustaining a School Garden". Last year we offered the workshop in Traverse City and at the Tollgate Education Center and Farm in Novi. This year we will be offering the workshop in Jackson County on Wednesday, February 24, 2016 and again at the Tollgate Education Center and Farm in Novi on Tax Day, Friday, April 15, 2016. I started distributing a survey last year to get input from the people that work in school gardens on what types of training and resources they needed and wanted. I figure the best way to give you what you need is to ask YOU. I am distributing a survey again this year, and we will design our workshop based on the information we will receive. So, please, click on the link below and give us your input on what types of training and resources would be the most meaningful for you by completing the brief survey. I know your time is valuable, so the survey is only 17 questions long and SHOULD TAKE ONLY 10 MINUTES TO COMPLETE. There will be even less time involved if you do not yet have a garden at your school. I will be happy to share the results with you and welcome your feedback. So please help us out and take the survey at the link above. If you can, please save the date of either Wednesday, February 24, 2016 for the Starting and Sustaining a School Garden workshop in Jackson or Friday, April 15, 2016 for the Starting and Sustaining a School Garden workshop at the Tollgate Education Center and Farm in Novi. The flyer and registration information for both will be available when you return from the holiday break on January 5, 2016. Please give us your input even if you are not planning on attending the workshop – the more information, the better! I've also added a few more educational opportunities below the School Garden Grant Information. And, as a holiday bonus, I've included an article from the Wisconsin School Garden Initiative. Enjoy! The Wisconsin School Garden Initiative, a program of Community GroundWorks, aims to support and connect school gardens throughout the state, including gardens at after school programs and early education sites. To learn more, visit www.wischoolgardens.org." When Gardening met Upcycling, it was love at first sight. Their children are the School Garden Fairies that turn outdoor classrooms into treasure troves of would-be trash, each object reimagined as a trellis, flower pot, bird feeder, stepping stones, or work of art. According to hipcycle.com - an online marketplace just for upcycled products - upcycling is "the process of converting old or discarded materials into something useful and often beautiful." 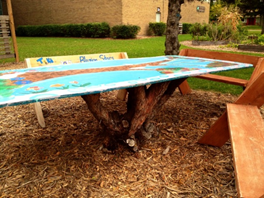 When it comes to facilitating a school garden program, this concept comes almost naturally. How does one acquire things that: look nice, fill a specific need, inspire creative thinking and natural inquiry, and don't cost a lot of money? The answer: use what you've got - or what other people might throw away - to create what you need. Upcyling projects also have plenty to teach about conservation, art, engineering, and the like. It is certainly not a new concept - in all likelihood, your grandma was probably a champion upcycler - and yet the feeling of ingenuity it generates is a delight for new learners. We have sifted through some of the best upcycling ideas we can find for this newsletter and put the overflow on our Pinterest page, but we are certain there are more. Send us your best garden upcycle idea, and we'll share it with the Wisconsin School Garden community! Note: Before embarking on any upcycling project, make sure to do your homework - research the contents of any item you plan to re-purpose to ensure it does not pose a risk to the health of students or the surrounding environment. Tires are one item that has sparked debate among gardeners . 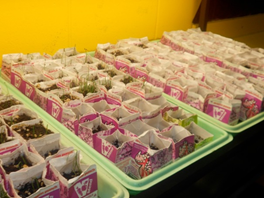 Left: Milk cartons as seedling containers - from Galesville Elementary School. Right: An old, overgrown bush became the base for a new picnic table; the garden team was not allowed to remove the bush, but it could be "trimmed" - from Toki Middle School. Header photo: Old tiles turn into an outdoor mosaic stage - from Orchard Ridge Elementary. 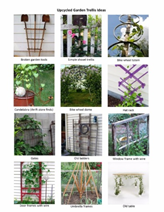 This collection of pictures is a great idea-starter if you are looking for a low-cost garden trellis that can double as artwork, or a lesson in resource conservation. This is by no means an exhaustive list. Send us your creative garden trellis ideas! Flower art is a no-brainer for gardens, and these re-purposed dish designs are large, colorful, and inexpensive to create. But working with ceramics can be intimidating at first. This is a practical guide that walks you through how to create this type of art, and more importantly, how to mount it in the garden and show it off! This manual will show you how to re-purpose a five-gallon bucket into a miniature garden. These transportable mini-gardens can be set up in courtyards or classrooms, sent home with students, or sold at fundraisers. Also provides information about choosing the best plants for containers. What to do with those old seed packets lying around? Have students do a germination test to see if seeds will still sprout. If you run into "duds", try them for art, counting or sensory activities. This guide has plenty of ideas for using old seeds, as well as a number of upcycled seed starting container ideas. This blog post brings together 20 creative, easy, low-cost ideas for creating plant markers for both outdoor and indoor gardens. 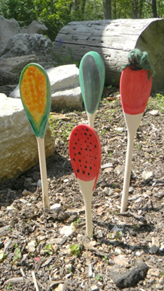 We especially love the upcycled spoons, and the decomposable twig markers! This building plan makes use of an old bed frame to create a sturdy garden cart that makes it easy for little hands to help haul big loads! This is an ambitious building plan, well-suited for a volunteer who is comfortable with tool use. We shared this plan several months ago, but the end product is so handy we had to post it again! We would love to hear about your garden grant stories, awards or applications! Please feel welcome to write us with them so we can highlight your experience in the newsletter. Certified, core academic teachers for grades K-12 that are interested in using agricultural concepts to teach core subject areas and enhance students' understanding of agriculture. More information and the application are available at this link. Formal or informal educators who are using innovative projects to enhance herbal education in school systems, communities or in any public forum. Any district or independent school participating in the National School Lunch Program is eligible. Must be submitted by district food service director. SAVE THE DATE: Starting and Sustaining a School Garden / Wednesday, February 24, 2016 Jackson Career Center, 6800 Browns Lake Rd, Jackson, MI 49201 Registration information will be available January 5, 2016, email Kristine Hahn at hahnk@anr.msu.edu after January 5, 2016 for details and the registration link. SAVE THE DATE: Starting and Sustaining a School Garden / Friday, April 15, 2016 at the Tollgate Education Center and Farm, 28115 Meadowbrook Road, Novi, MI 48377 Registration information will be available after January 5, 2016. You can email Kristine Hahn at hahnk@anr.msu.edu after January 5, 2016 for more details and the registration link. champions from across the country at Slow Food USA's first ever train-the-trainer school garden conference. Come and learn more about the Slow Food approach to school gardens, edible education, and school food and bring it all back to your community. Through a mix of hands-on workshops, field trips, and classroom-style training, we will provide information on our curriculum, projects and models, and give chapters and schools the opportunity to showcase their work. Would you like to attend or nominate someone to attend? Please fill out this google form application or share it with your Slow Food network of teachers and school garden leaders. The application deadline is December 31st. Any questions? Email lauren@slowfoodusa.org.